What if the World Ended Tomorrow? 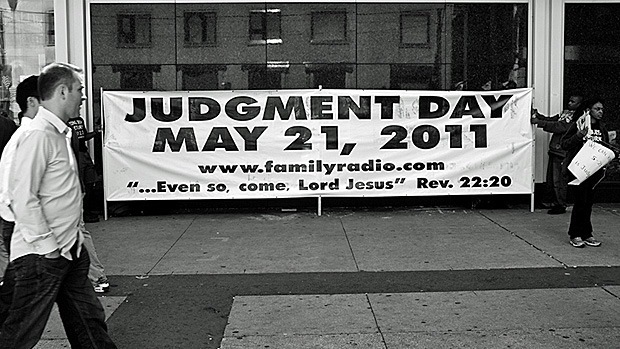 By now you’ve probably heard that the world is supposed to end on Saturday, May 21. At least, that is the teaching and motivation for several churches and internet sites. Most people shrug it off as typical cultish nonsense. Others take the time to study the information and write a response to it. And I’m sure there are many that still have not had the pleasure of hearing about it in the first place, but will on Sunday or Monday morning when they turn on the news and nothing has happened. I wonder, though, if we have missed an opportunity to learn a great lesson. What if the world ended tomorrow? How would your life look today? Shouldn’t we be living as if the Lord could come before you finish reading this post? Whatever happened to a belief in the imminent return of Jesus Christ? Am I living in a way that reflects a true belief that He is going to return? We don’t, do we? And why not? Because every once in a while, someone gets it into their head that they have figured out the day and the hour of Christ’s return. There is a huge panic for those who genuine believe that the message is true, and they scramble all over the world to share the Gospel. Then the day comes. And then it goes. Those who had faith to believe have their faith shattered. Those who mocked and laughed at those who believe laugh as they shout, “I told you so.” And the rest of us who are looking for Christ’s return feel like it’s just a bit further away. We forget, we lose hope, and we live a little bit more like He isn’t going to return. “They’ve been saying that for 2,000 years,” we here. Is Jesus really going to return? Do I really have to live like it is true? NO, no one knows when He is coming. “But concerning that day and hour no one knows, not even the angels of heaven, nor the Son, but the Father only” (Matthew 24:36 NKJV). Could Jesus come back on May 21st? Sure He could. But He could come today, too. Are you living like you know it is possible, like you know it is true? Don’t worry so much about whether Jesus is returning on Saturday. Instead, live as if He is waiting for the signal, and it could come at any moment. “Watch therefore [give strict attention, be cautious and active], for you do not know in what kind of a day [whether a near or remote one] your Lord is coming” (Matthew 24:42 AMP).